Released at the end of October, Pan Astral’s latest EP, Color Field, was inspired by Gabriel Otto’s frequent visits to Denver’s Clifford Still Museum. Serving as the band’s lead vocalist as well as guitar, bass, and keyboard player, Otto shares how the work of this particular Abstract Expressionist inspired Pan Astral to move beyond on lyrics in their own music. Otto, along with Tad Lusk (guitar/vocals), Kipp Koren (bass/keys), and Mike Smith (drums/vocals) sat down to discuss Pan Astral’s unique brand of rock music in this exclusive AXS interview. Mike Smith: I was born in Denver, but I spent some of my childhood in Lompoc, California. Kipp Koren: Buffalo, New York. Tad Lusk: I'm a Denver native. Gabriel Otto: I was born in Kalispell, Montana and made it to Denver by way of Seattle, Portland, Amsterdam, and Chicago. AXS: What brought Pan Astral together? Kipp: Gabriel and I met at a Digital Beat Down concert. They're mutual friends of ours. Gabriel: Kipp invited me to a show he was playing later in the week with a really cool instrumental band called Surround Sound. Tad was in that band, and after seeing them together I invited them both to my studio to mess around with sounds and see what happened. Mike came along a bit later through knowing Tad. Ryan Burnett of Signal Path who had started the project with me was still loosely involved at that time. AXS: How long has Pan Astral been together? What have you learned during that time? Kipp: Two years with this lineup. Mike: Playing with Pan Astral has made me think outside the box in relation to how I approach writing my drums parts to help compliment the music. Mike: At the Larimer Lounge. Gabriel: We'd all been practicing the songs for so long, so we were a bit nervous. Mike had to wear huge earphones that looked hilarious. We opened for American Royalty. AXS: Have any Denver musicians inspired Pan Astral? Gabriel: I think Sunboy, Inner Oceans, and Rose Quartz are all very good. Man Cub really made an impression on me when they were at it. AXS: What inspired your new EP, Color Field? Gabriel: During the time we were writing the music for the EP, I was frequenting Denver's Clifford Still Museum. Clifford had belonged to a school of Abstract Expressionists who came up with the term “color field.” In their work, they were stating that color had become freed from its objective context and could now in fact become the subject matter of a painting, as opposed to a human figure, a landscape, or any other traditional subject. This is something like what had begun to happen to our music; the textures and chord arrangements of the new songs had become so much more central on many levels, as opposed to lyrics. AXS: What was the writing and recording experience like on Color Field? Mike: It was a fun process for me, writing and figuring out the songs with the guys. I feel we all work really well together. Gabriel: Just before meeting everyone, I had been writing most of the songs myself. I wanted to let go of that a bit. Kipp and Tad began to come up with some really gorgeous chord progressions and textures. We kept editing them together, keeping them as spontaneous and raw as possible. Mike would come up with rhythm parts that accentuated the sound either live in the practice room or later in the studio. We'd then get together and record. After they'd leave I'd just sit in my studio, letting the sound wash over me for hours and feeling out what to sing about or what the melody would be like. Tad: We really took our time with adding, subtracting, mixing and repeating the process until we got each song to a place where we felt like it was finished. Color Field was a long time coming, and I think it shows. Kipp: The songwriting is on an even keel right now. We all play together and listen, striving for the integrity of a song while trying not to step on each others' toes. AXS: What else is Pan Astral involved in locally, either as individuals or as a group? Gabriel: I've been practicing, recording and performing with Lotus and now more recently, Flobots. I'm a working visual artist and volunteer for Ten Thousand Villages and Project Worthmore as an art teacher. Mike: I am engaged to my beautiful fiancé Sarah and we have a beautiful daughter that is 5 months old. She has been keeping us both very busy along with our day jobs. I currently work in the telecommunications field. Kipp: I have seasonal businesses and control how much work I do. Staying out of offices and corporate lifestyle is a must for me. AXS: Does Pan Astral have a goal in mind for the sound the band produces? Are there certain influences or themes the band tries to inject into its own music? Gabriel: Thematically, we're not really trying to do anything deliberately. Spontaneity plays a huge part in our process, so things are just really honest and not over thought. Key themes such as love and social justice are always making their way into the lyrics, but things stay somewhat abstract. I like to think our sound is unique because it juxtaposes key electronic music elements from more peripheral genres such as drum and bass, acid house or jungle with traditional pop structure and what you could call 'adventurous chording'. The mixes are not so vocal heavy, meaning the volume of the vocals are on a more even playing field with the rest of the instruments than traditional pop music. The sound can be euphoric at times. It's always very uplifting to me. AXS: For someone who has never seen or heard Pan Astral, what would you tell them to entice them to watch your set? Kipp: I always explain its very unique rock music with an undertone of electronics. We hit pretty hard at times, but there are many moments when the music has a beautifully hypnotic, ambient quality. 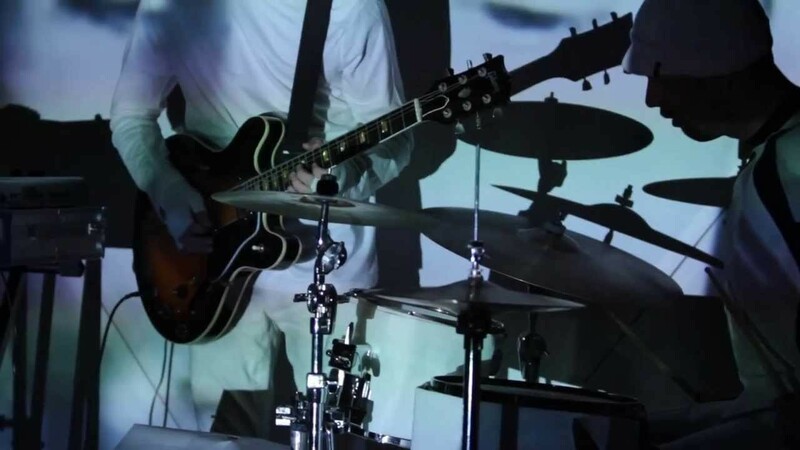 When we headline a show, we wear all white and project layers and layers of images and video onto a giant home made triangle screen behind us. Jordan Leonard does the projection mapping and it's really, really good. AXS: What would your ideal live show look like? Where would it take place? Any particular time of year? Would a specific band/musician share the bill with or open for Pan Astral? Tad: Red Rocks. Late summer. I want to watch the sun go down and see the lights from the stage illuminate the rocks and the people in the audience in washes of color. Would be great to share the bill with a band with a similar aesthetic, not sure who specifically. Gabriel: With musicians who are open to new ideas and always searching for a new sound. Leave the cool guy ego at the door. AXS: What shows are you looking forward to over the next few months? Gabriel: We're toying with the idea of collaborating with some local visual artists. I can't go into detail because it's meant to be a surprise. Tad: It's happening enough where it feels fertile and creative. There are shows and events going on at all times, but it's a pretty small community in the sense that you're only a couple degrees of separation from anyone. You feel connected. Gabriel: It's open and supportive and I see a lot of ingenuity. There's a lot of DIY stuff going on, as well, which is very exciting to me.